As healthcare organizations start to dip their toes in the waters of distributed ledger technology, the COO of Hashed Health offers advice about doing it right. Blockchain is no longer the far-out and inscrutable mystery it once was. More and more healthcare professionals are starting to understand how it works – and how it can work for them. "They're beginning to understand the technical questions around it, which is fundamentally about shared infrastructure," said Corey Todaro, chief operating officer at Nashville, Tennessee-based blockchain company Hashed Health. 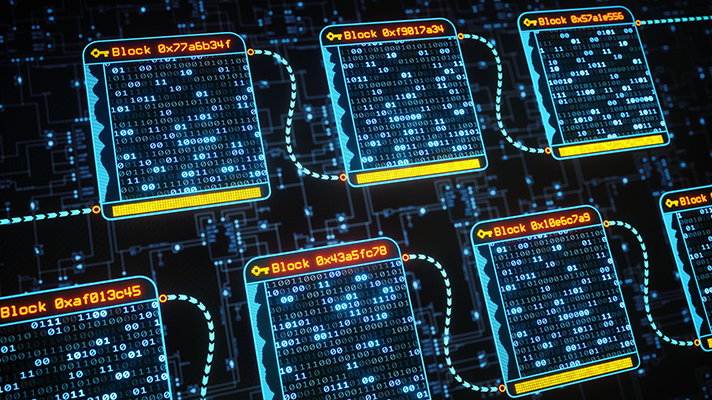 At its core, blockchain is about networks: "Enterprises jointly share and operate transactional infrastructure, and they do so for a value proposition," Todaro explained at HIMSS18. So the more healthcare organizations that decide the distributed ledger technology might be right for them – whether for claims processing, credentialing or other work – the more those networks will grow and the faster blockchain will catch on across healthcare. But it's worth doing some hard thinking before diving deep into such a new way of doing business. After all, that dynamic means that hospitals essentially surrender a certain amount of control over the infrastructure such that the value proposition of real-world use cases must be very clear. "We're convinced that there are revenue streams and business models that are enabled by using blockchain that are not possible using current client-server architecture," said Todaro. "But it takes some understanding to articulate what those are." Consider provider credentialing, and healthcare's ongoing attempts to solve that "pain-filled and fractured process. Driving efficiencies in the way provider credentials are validated could have a direct ROI for hospitals and payers, said Todaro. "We calculate about $7,500 a day in deferred net revenue per doctor that you take to credential them. Over 100 days, that's a lot of money." Blockchain is well-positioned to help. The challenge comes from multiple sources of data, some that don't have a primary source associated with it. Meanwhile, there's a regulatory structure that requires biennial vetting, re-credentialing and other duplicative work centered around phone calls and faxes. "Blockchain can take that employment verification form and create a transactional layer that tracks that artifact and prove mathematically that it was created by the primary source," said Todaro, through what's called a public-private key pair. "In addition, we can hash that artifact – create a unique digital fingerprint of that data – on the blockchain transaction," to prove it came from the original source and is fundamentally unaltered." Credentialing is a great use case to start with because it's a well-known problem and a pain point for both sides of the payer-provider divide across the industry. But that doesn't mean payers and providers are ready to take the leap, said Todaro. "When I show people, they begin to get it, the new economic dynamics that can take place, but they recognize that this is something very forward looking, that does not fit the current framework of how we do things in healthcare," he said. In the meantime, those health organizations looking to see what early blockchain projects might do for them should keep some things in mind. Todaro offered four bits of advice to ensure optimal exploration of this new way of doing business. 1. Never lock yourself into a single protocol. "Blockchains are deployed through open-source protocols," he said. "There's Ethereum, there's a number of them under the Hyperledger, like Fabric, Sawtooth Lake, with backers like IBM and Intel." Those protocols are fast-changing, with feature sets and functionalities that are still emerging and evolving. The organization will want to maintain flexibility here, and be able to "experiment and fail fast," he said. "You don't want to pick a protocol and put all your eggs in one basket. At Hashed Health, we're protocol agnostic. We want to bring the particularities of the use case, and use that to select the protocol rather than the other way around. That creates more effort on our part, to be conversant in multiple protocols, but I think that's where the value is." 2. Come up with your own enterprise blockchain strategy. More and more C-suites and boards are going to their IT leaders and saying, "What are we doing on blockchain?" said Todaro, without really knowing what the tech is all about. It's critical to think critically about this new tool. "Enterprises really need help getting their arms around the technology. One of the things we do is go into an enterprise and help you understand, being former healthcare operators ourselves, what's your business, what are your strategic goals and – importantly – what's some of your technical debt around data infrastructure that you've already invested in and you're not going to want to reopen or spend more on. It helps us understand your business pain points and we can help ideate use cases that fit that strategy." His advice? Start experimenting with a couple use cases. See if certain features and functions actually mature. Keep an eye on how the value might evolve in the short term. "Hedge your risk, limit investment to something well-defined, and make sure the scope of the risk is something you understand very well." 3. Participate in a pilot. "That enterprise strategy is a precursor to actually participating in a build," he said. "We can't help convene these networks unless the industry is educated around that. Fundamentally, blockchains are network plays. And unless the network constituencies and counter-parties are conversant and familiar, we're not going to entice them into these networks that we're designing and convening. So we have to do that hard work of getting people up to speed and helping them understand use cases and what it means to participate and what's the benefit of participating early." 4. Get on board early. This year should see more and more organizations beginning participation in what's called a minimally-viable network for blockchain pilots, said Todaro. "By coming in early, you're going to be able to help design that governance agreement. Come in later, and you're going to be given that agreement and told, 'Yea or nay, do you want to participate or not?'" While blockchain may seem far off, or over-hyped, or just not worth the effort yet, it's real and potentially very useful. Now it's up to healthcare organizations who could most benefit to educate themselves and make judicious first steps. "There's a whole range of companies in healthcare that need blockchain, or who want to look at blockchain more urgently than others, and those are people who are sitting in the middle of a lot of transactions, or who want to efficiently transact business processes," said Todaro. "Those kinds of enterprises have to think hard about the value they could be adding to a transaction set and really help articulate blockchain use cases that recognize that." Todaro thinks it's at least "another year-plus" before blockchain is resting comfortably on the so-called Plateau of Productivity of Gartner's hype cycle. "In 2018, you're going to start seeing the first production-scale blockchains -- a minimally viable network of enterprises that are using the blockchain for a business function,” Todaro said. That stage is where the hard learning will take place and enterprises will begin ironing out governance and other issues. But then in about two years from now, "we're going to be so conversant with the trust layers that blockchain can offer that blockchain will recede its ubiquity in the same way that client server architecture did," he said. "We don't think about it anymore, we just think about what it does for us. That stage is at least three years away."